Tarcoola Village residents and Men's Shed attendees, Ted Lea and Lex Legelin with Shepparton Villages CEO, Kevin Bertram, Tarcoola Village resident and Men's Shed attendee, Don McKellar and Member for Shepparton, Jeanette Powell. Photo: Alicia Zeqir. The $56,944 of funding will help Mooroopna Men's Shed, Shepparton Village Men's Shed and Tatura Men's Shed (Ross Street) improve their facilities including expansion works to accommodate for more members, the installation of a hydronic heating system and inverter cooling systems as well as upgrades to existing toilet facilities. Shepparton Villages CEO, Kevin Bertram said, "The $12,409 grant we are being provided with will allow us to upgrade the air conditioning in the facility and we are very grateful to be receiving this support from the government." Member for Shepparton, Jeanette Powell said, "Men are used to having a shed and when they go into retirement villages they still have the need for stimulation. The Men's Sheds provide a way for these men to utilise their current skills, learn new skills and interact with others." 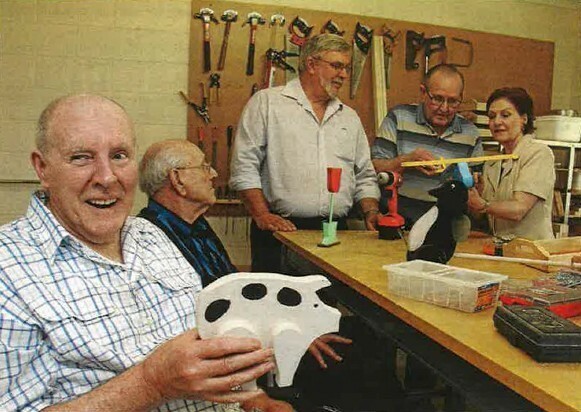 Shepparton Villages Men's Shed Co-ordinator, Jennie Brittain said, "The funding is going to make the Men's Shed more enjoyable for the residents and will help to boost attendance numbers." Shepparton Villages Men's Shed Maintenance and Projects Manager, Ed McNair said, "This funding will help to provide a lot of comfort for our residents and all the work of installing the systems will be done by local contractors, so it is a positive thing for the whole community."